Sullivan seemed genuinely puzzled as to why such a large event, that draws hundreds of thousands of people, was covered by the Times with just a single photograph and a two-line caption on page A17 of the paper. She noted that this lack of coverage drew several complaints from readers, and decided to ask the Times’ Washington bureau chief, Carolyn Ryan, why the paper didn’t assign a staff reporter to cover the story. Ryan told Sullivan that the Times had given extensive coverage to opponents of abortion with its front-page story on Tuesday – the day before the march. The story was about newly energized efforts by Republicans using ballot initiatives and legislation in Congress, and a three-column live staff photograph of the event on its national election page, plus a Reuters story on the event. Ryan added that they cover every protest, and that they tend to focus on the “substance” of the issue. She also alluded to the smaller crowd this year, due to the bitter cold, as yet another factor. Sullivan, to her credit, didn’t buy Ryan’s excuse and said that the Times should have covered the march with a staff reporter in Washington. She said that even though the crowd was smaller, it’s still a major event, and there were fresh angles to cover. Not covering the event, Sullivan said, only “gives fuel” to those who accuse the Times of being anti-Catholic, and those who see it as reflecting a liberal bias by the paper. She added that the march had significant news value, and deserved more than a photograph in Thursday’s paper. Yes, a big snowstorm that struck the D.C. area on Tuesday combined with the bitterly cold temperatures to keep the crowd size down this year, as compared to previous years. But that doesn’t diminish the March for Life’s newsworthiness, as Sullivan said. 1. What is Roe v. Wade? 2. 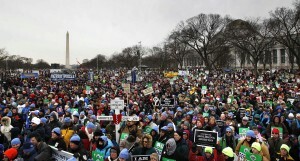 What is the the March for Life? 3. What is a public editor? 4. What type of bias did the New York Times display in its reporting on the 2014 March for Life? a) Were you aware that there was a pro-life rally, held every year in January for the past 40 years, attended by so many young people? b) Do you agree or disagree with the assertions made by these two readers? Explain your answer. c) Do you think The Times (and the media in general) portray pro-life/right-to-life/anti-abortion supporters in a negative light while portraying pro-choice/pro-abortion in a positive light, or vice-versa, or do you think they report only the facts about the supporters of each position? Explain your answer. 1. Roe v. Wade was a 1973 U.S. Supreme Court decision which legalized abortion; the justices ruled that women have a constitutional right to an abortion. 4. The New York Times displayed bias by omission and story selection over its reporting (or lack of reporting) on the 2014 March for Life. 5. a) b) and c) Opinion questions. Answers vary.